By default, all new documents in Word 2007 will open with the "default font" applied to the file; this means that unless you manually change the font family ("font face") of your document, it will use the default font. Since Microsoft Word 2007 supports multiple fonts in a single documents, you can mix a variety of font styles and text size at any point. In this tutorial, we will show you how to change the default font face (font family) and text size for new Word documents from the standard "Calibri 11 points". First, if needed, start by launching Microsoft Word 2007. Once the program has opened, make sure that the "Home" tab is currently selected (it should be by default). As soon as you do, Word 2007 will open the "Font" dialog: choose a font family (font face) you want as default from the Font scroll box, a Font style, and a text Size you also want set as the default setting. You can then go further, and configure the default text color, text effects, etc. Notice that Word 2007 includes a Preview pane at the bottom of the dialog, which lets you see in real time the changes you are about to make to your default font and text settings. The "Normal Template" is a special Word document that Word 2007 uses to configure the default settings (including font face, font style, and text size) for all new, blank documents. 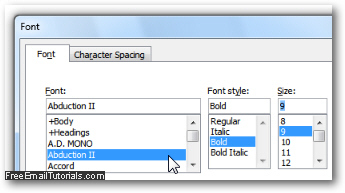 When you change your default font settings, Word 2007 will save that change and apply these options to the default template - click "Yes" to proceed. You can now click on the OK button to return to your Word 2007 document. You have successfully changed your new default font family and text size settings. The next time you open a document from this particular copy of Word, all these settings (saved inside the "Normal Template" will be automatically applied). As you'll learn in the next tutorial, changing the default font in Excel 2007 works a bit differently.